Knowledge is power, and nowhere is this truer than when it comes to forging a strategic advantage over your business’ competitors. Only by closely analyzing your company can you come to fully understand where your brand stands in reference to market trends and competitors. The SWOT matrix is applicable in making all sorts of decisions in business (and even in your personal life). But for our purposes, we’ll look at applying SWOT to decisions that impact what goes into our business proposals, in an effort to win bids on a consistent basis. Using SWOT to make a business decision will shed light on the state of your business, allowing you to better position your company in subsequent business proposals. Simply put, by understanding exactly what your SWOT status is, you can work to emphasize your plusses, while minimizing your minuses. SWOT analysis is typically completed in a workshop setting by a given company’s leadership team. However, in a small company or for a freelancer, it might be just you or two to three people involved. There is nothing complicated in SWOT, all you need is a whiteboard, several markers and a passionate team. No whiteboard? No problem, just draw everything on paper! The idea of SWOT workshop sessions is to take a long, hard look at your business and frame its realities against its goals – aligning the discrepancies as often as possible. 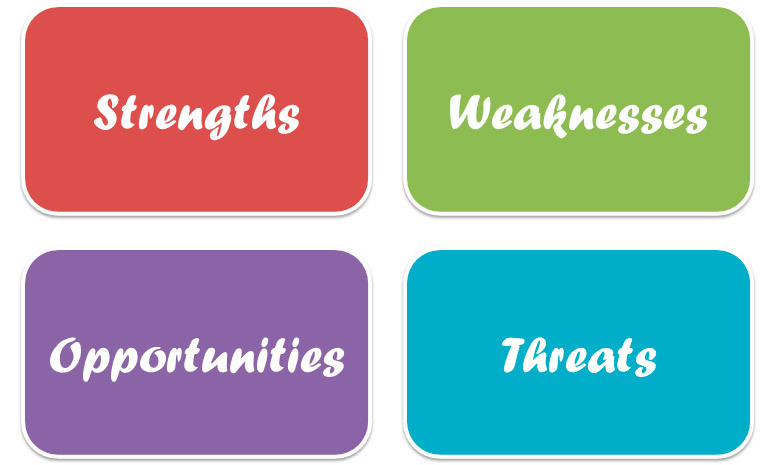 SWOT is actually divided into two channels: the internal factors of Strengths and Weakness, and the external factors, opportunities and threats. Let’s have a closer look at analyzing the internal and external aspects of SWOT. SWOT begins with perhaps the most positive facet of the analysis: your company’s strengths. Your business strengths are probably immediate to you, but uncovering all of them might require some deeper reflection. What has been successful for you in the past? How have you lowered costs compared with market averages? What types of positive feedback have you received from existing customers? Finding answers to questions like these should be the result of the strength-finding workshop. Your team should be pulling strengths from statistical sales data, as well as from intangibles, like customer perception and employee satisfaction. The more legitimate strengths you can identify, the more of them you will be able to callout, with authority, in your future decision-making processes. Some of us like to avoid thinking about their business’ weaknesses; others of us tend to dwell on our weaknesses. In either case, the SWOT workshop is the appropriate forum to bring all those unpleasant shortcomings to light. Fortunately, this process of recognizing and acknowledging your company’s weaknesses allows you to overcome many of them, in all posterity. Let’s delve into the kinds of things to watch for when it comes to assessing weaknesses. What areas could use immediate improvement? What strategies have failed to realize results? What internal factors are causing lost sales? What relevant functions of your business are you unable to deliver? Although, for most purposes, the weaknesses you note should be ones that you can internally influence, it is important to gauge external reaction. How do people perceive your efforts? If the answer is poorly, then some internal factor is causing them to see it that way. Factoring weaknesses is the time for brutal honesty and healthy introspection. You’ll thank yourself once you’ve been able to combat the problems you discover. The next major point in using SWOT to make a business decision is identifying opportunities. I am sure that you are already aware of just how beneficial such an exercise can be. If you identify an opportunity that you had never thought of, it can potentially unlock a new revenue stream – which is always a welcomed event! Are there emerging trends that you have overlooked? Has technology changed in your industry? Has a new, leaner methodology emerged that would increase your bottom line? Have consumer buying habits changed in way that you need to address? Has a former competitor left the marketplace? The sky is the limit, though, when it comes to spotting an opportunity. In this area you should leave no stone unturned. Every opportunity that you identify can potentially benefit your business’ future endeavors. The final component in the SWOT matrix is that of addressing threats to your business. External threats run the gamut from competitors and disruption, to changing government regulations and consumer interests. Threats differ from weaknesses because you do not always have absolute control over external factors, whereas you can generally dress-down weaknesses in-house. As such, threats must be overcome at every chance. Do your competitors control greater market share than your business? Is there a bad public image related to your brand? Has a new government regulation imposed an unplanned cost on your company? Are you struggling to get venture capital or maintain cash-flow? Threats can come from anywhere, even from sources you might not expect. Most companies are at least casually aware of certain threats, but others might come as a total surprise to you. Again, this portion of the SWOT analysis process is sure to be eye-opening and beneficial. Once you’ve compiled your SWOT findings, you will have a far better picture of your overall business than before. 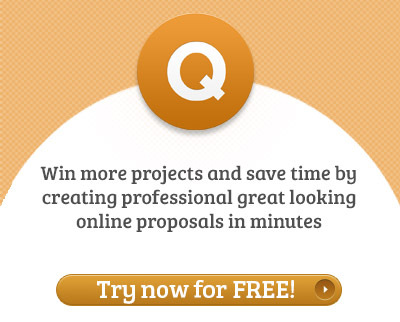 As you can see, this information is of key importance in creating business proposals. Not only can you use SWOT to make a business decision about what to put into your proposals, the resulting information will be transparent to those who receive your proposals. This means that SWOT, when accurately related to your business proposals, will help underline the strengths and competitive advantages of awarding a bid to your company. As such, SWOT is a win-win. The more knowledge you enamor yourself with, the more you’ll be able to make informed decisions around that knowledge. SWOT allows you to know your business better than you already do, and that translates to being able to grow your business. So, do you know your business’ strengths, weaknesses, opportunities, and threats?